Back to school woes? Maybe you could use a few half days just to break up the monotony of going to school all day every day? If this was 1922, that would be a very distinct possibility. 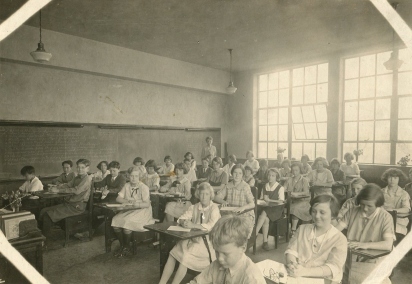 When 6,000 students resumed school in September 1922 it was found with much chagrin that four of the nine schools were impossibly overcrowded, including notable schools such as Longfellow, Whittier, and Emerson. Overcrowding becoming a problem was seemingly unavoidable, as building projects at these schools were delayed for unspecific reasons and construction at other schools had not advanced far enough to provide any real support. As a result of this overcrowding the Board of Education had to grudgingly shorten all primary school days to half days to accommodate the students. The Board was not satisfied with this temporary fix, and bids for construction on a new school which would eventually become Hatch School were shown at the September Board of Education meeting along with plans for additions to Beye and Holmes schools. They increased the number of teachers employed in Oak Park from 191 to 204 in attempt to deal with the excess of children. The Board also introduced a special election to confirm a June referendum that would empower the Board to levy a tax not exceeding one per cent for buildings and grounds, and three per cent for educational purposes in order to give the Board extra revenue in order to ensure Oak Park maintains its high standards of education.